There isn't really that much to remember when you choose a food storage container for your sausage making...but there are some things to think about. It's important to make sure that you only use food grade containers for all of your sausage mixing and storage. Any new containers you buy should specify whether they are food grade on their label, and that helps make your decision easy. Your choices can get a little trickier if you want to recycle or re-task a container though. Glass and stainless steel are almost always food safe, and you need not worry about containers and mixing bowls made from those materials. It's plastic containers that can cause confusion. Here are some ideas that will be of help to you. You're going to need a large tub to hold your ground meat and to use when you mix in your spices. 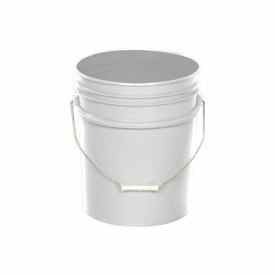 There are tubs specially designed just for the task, and you can find them online starting at about $25. Again though, make sure anything you buy is specified food grade and designated as a food storage container. You may already have a perfectly acceptable mixing and storage tub in the house. For a long time, I used nothing more than a regular 45 quart plastic picnic cooler to mix my sausage in. I still pull it out when I'm doing extra large batches and need more than one tub. Coolers, of course, are made of food grade plastic and...They have the added benefit of great insulation to help keep your sausage cool while you're working with it. 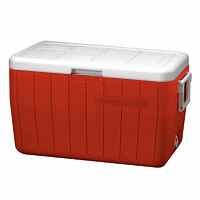 As long as the interior of your cooler has been kept clean and has no cracks or deep scratches to hold germs, it will work just fine. I also love the large plastic commercial pails that once held things like frosting, salad dressing, and pickles. They make great multi-task bulk containers. Restaurants get lots of their wholesale supplies in buckets like these and usually have empties. They have already been used for food storage, so you know they are safe. I used to be able to get these pails free for the asking. Most places now want a dollar or two for their empties, but it's still a great deal. The only other storage issue you will have is somewhere to keep your spices. I find that one great choice is stacking Tupperware containers, and I have a large selection of them. The great thing about Tupperware is that it is opaque (keeps out the light) and air-tight (you burp'em). It will keep your spices fresh for a long time. If you don't already have Tupperware (or something similar), and don't want to buy any, you can just as easily use recycled glass containers (like common canning jars). Be sure to store them some place dark though, because light will degrade your spices quickly. You may also find that your spice storage problems have already been addressed by your supplier. At least 2 of the on-line spice shops I buy from package their products in nice, opaque, screw-topped plastic jars. I save those jars when I empty them. If a new supplier sends me bulk spices in bags, I recycle my used containers. ...Bakeries are a great place to hunt for empty plastic food buckets. Most of them get their frostings and fillings shipped to them this way. ...Glass containers are naturally "food grade" so glass makes a great food storage container material. ...Any plastic container that originally held a food item can be assumed to be "food grade". Remember, almost anything can do service as a food storage container for sausage making duties as long as it's made of food grade material. Use your ingenuity, and you will save some money.